Veeru Devgan is an Indian stunt and action choreographer and film director in Bollywood. Born into the Devgan family in Amritsar, he is married to Veena, and has four children with her, including the actor Ajay Devgn and director Anil Devgan. He has choreographed fight and action scenes for over 80 Hindi films. He has also directed a film – Hindustan Ki Kasam (1999). 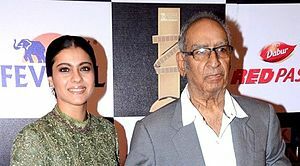 ^ Sinha, Seema (1 November 2009). "Extra-marital affairs happen: Ajay Devgn". Times of India. Retrieved 2 February 2010. ^ Taliculam, Sharmila (23 July 1999). "A clutch of cliches". Rediff. Retrieved 2 February 2010. This page was last edited on 4 April 2019, at 10:00 (UTC).